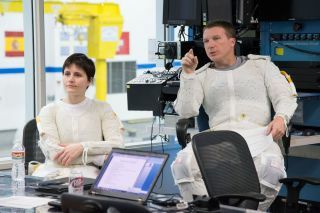 On May 10, 2013, wearing the thermal undergarments for their extravehicular mobility unit space suits, NASA astronaut Terry Virts and European Space Agency astronaut Samantha Cristoforetti confer with space walk experts and trainers (out of frame) about procedures and techniques they would later rehearse in the waters of the Johnson Space Center's Neutral Buoyancy Laboratory (out of frame on the floor below). The ground based rehearsal was in support of a possible weekend space walk to be performed by two NASA astronauts aboard the International Space Station as they attempt to trouble-shoot an ammonia leak issue, discovered earlier in the week. Astronauts on the International Space Station are gearing up to perform a potential emergency spacewalk Saturday (May 11) to hunt for an ammonia leak in the orbiting laboratory's cooling system. NASA astronauts Tom Marshburn and Chris Cassidy are planning to spend more than six hours outside the station to find, and possibly repair, the ammonia coolant leak. It also comes just two days before Marshburn and two crewmates, station commander Chris Hadfield of Canada and Russian cosmonaut Roman Romanenko, are due to return home on Monday, May 13. The departures and arrivals of the crewmembers will not be affected by the spacewalk, NASA officials said. The space station crew is in no danger, and the pump has been turned off in order to slow the rate of leaking coolant, mission managers said. The leak is on the space station's Port 6 truss, at the leftmost side of the outpost's football field-length main truss. "[The] objective is to get a look at the leak," Mike Suffredini, NASA's International Space Station program manager said of the spacewalk during a briefing today. A team of NASA officials will meet later tonight to make an final decision whether to proceed with the spacewalk. If approved, the excursion will begin early Saturday at 7:15 a.m. EDT (1115 GMT). The spacewalk will air live on NASA TV beginning at 7 a.m. EDT (1100 GMT). You can watch the webcast live on SPACE.com, courtesy of NASA. If the spacewalk does go forward, Cassidy and Marshburn will float outside of the station to inspect the leaking loop. The two astronauts will then attempt to replace an ammonia coolant pump that station engineers suspect may be the location of the leak, NASA officials said. Marshburn and Cassidy have both conducted three spacewalks — two of them together — during their 2009 mission on the space shuttle Endeavor. The experienced team's spacewalk is expected to take a little more than six hours. "The crew is very familiar in this area," Norm Knight, NASA chief flight director said during the briefing. This type of repair, however, is unprecedented in the space station's history, he added. Usually spacewalks are planned months in advance, but this is the first time a space station crew has been expected to do a spacewalk on such short notice, Knight said. If this spacewalk doesn't correct the leak, the space station can still function normally using seven of its eight solar arrays, Suffredini said. This is not the first time space station crewmembers have spacewalked to repair a coolant leak. Last year, NASA's Sunita Williams and Japanese spaceflyer Akihiko Hoshide took a spacewalk to troubleshoot a leak in a coolant loop on the station's Port 6 truss (its scaffolding-like backbone). The 2012 coolant leak was in the same loop as the current leak, but engineers don't yet know if the two leaks are related. Canadian Space Agency astronaut Chris Hadfield, Marshburn and Cassidy are part of the station's Expedition 35 crew, along with Russian cosmonauts Pavel Vinogradov, Alexander Misurkin and Romanenko. On May 28, three new crewmembers are expected to launch from Kazakhstan to join Vinogradov, Misurkin and Cassidy on the International Space Station.